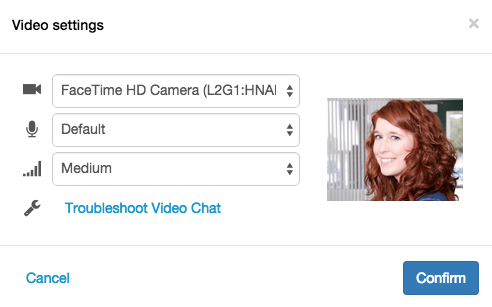 Configure video chat settings for camera, microphone, and video bandwidth. To access video chat settings, select Video settings at the top of the video chat window. Choose camera, microphone, and bandwidth settings. If you are having problems with video chat, run a diagnosis of your equipment and connection with Troubleshoot Video Chat. Camera setting: From the list, select the camera you want to use, or select Default. Microphone setting: From the list, select the microphone you want to use, or select Default. Low Uses less bandwidth to send and receive video. HD As the default setting, sends and receives video in the highest definition your camera and network support. If PureCloud detects latency in the network or computer, it automatically degrades the video quality. Actual resolution and frame rate may be lower depending on the network. Troubleshoot Video Chat: If you are having trouble using video chat, click Troubleshoot Video Chat. PureCloud checks the camera, microphone, and connectivity to the PureCloud service and shows any issues it finds. Click Submit Diagnostic to submit the report to PureCloud Support.